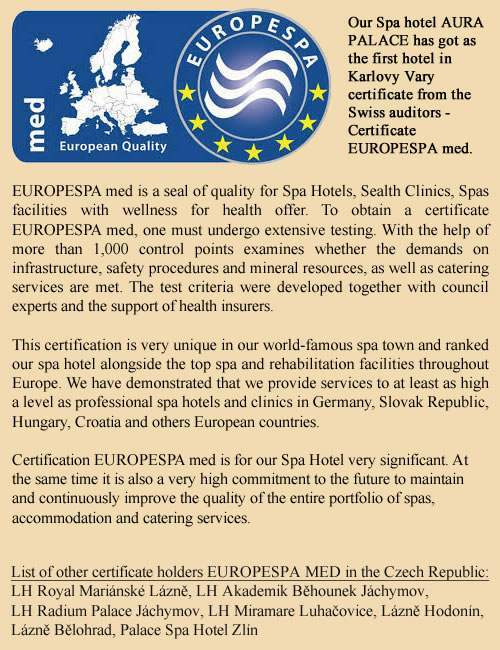 The first hotel in Karlovy Vary to receive a certificate of quality from the Swiss auditors – EUROPESPA med. Only in the hotel Karlsbad Grande Madonna progressive unique technique: XENON THERAPY. Hotel and Spa Karlsbad Grande Madonna**** is located in the historic spa district of Karlovy Vary, 100 m from the main source of the hot spring Vřídlo (72°C), in the immediate vicinity of medicinal springs and magnificent colonnades. 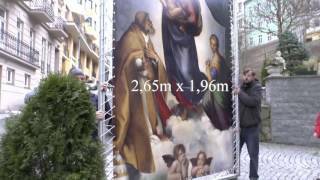 Its central location does not reduce the intimate and tranquil atmosphere of the quarter, thanks largely to the peaceful presence of the baroque church of st. Mary Magdalene just next door. The unique location of the hotel allows for convenient visits to the progressive drinking cures at the springs, and allows easy access to all the touristic, historic, and shopping destinations on foot. Luxurious accommodations are available in comfortable and elegantly furnished “de luxe” rooms and suites. Each room has its own style and is equipped with the utmost care and attention to detail to make you feel as pleasant as possible. All rooms are non-smoking and each is equipped with free Wi-Fi! Hotel Karlsbad Grande Madonna has its own parking in front of and behind the Hotel. Great gourmet experiences with and special spa diets are prepared and served by a team of experienced chefs in our stylish two-story Grand restaurant, which also serves a buffet-style breakfast. The hotel complex also includes a top class restaurant called U Křížovníků, themed after a medieval tavern of the Knights of the Order of the Red Cross. The renowned local cuisine provides a rare culinary experience both tohotel guests and other visitors. For a quite drink or chat, the hotel lobby bar is a popular meeting place with comfortable seating and good coffee or hot chocolate. We are also very happy to welcome you at our exclusive Spa & Wellness Center, which offers a comprehensive Carlsbad spa treatment under medical supervision and a wide range of spa and wellness treatments, which use the natural healing properties of thermal water fed directly from the nearby hot spring Vřídlo (72°C). You can enjoy a wide range of treatments, regeneration, relaxation and wellness stays, or come for a romantic weekend, family celebrations, or business retreats. We will be pleased and honored to take care of you. Treatment program for health and beauty of the body, mental well-being of men and women. Short-term wellness spa program for relaxation and recreation. Stay for cleansing the body and improving metabolism, returns vitality and slows aging. COMPREHENSIVE CARLSBAD SPA TREATMENT is the most effective method for detoxifying the body, which can currently be purchased on the market with detox products.